Nina Simone: Life and Music of the "Priestess of Soul"
Legendary jazz pianist and singer Nina Simone composed over 500 songs, recorded almost 60 albums. She was the first woman to win the Jazz Cultural Award and contributed through her music and activism to the Black Freedom Struggle of the 1960s. She lived from February 21, 1933 to April 21, 2003. Her birth year is given variously as 1933, 1935 and 1938. 1933 seems most credible, as she was a high school senior in 1950-51 when she attended Juilliard. 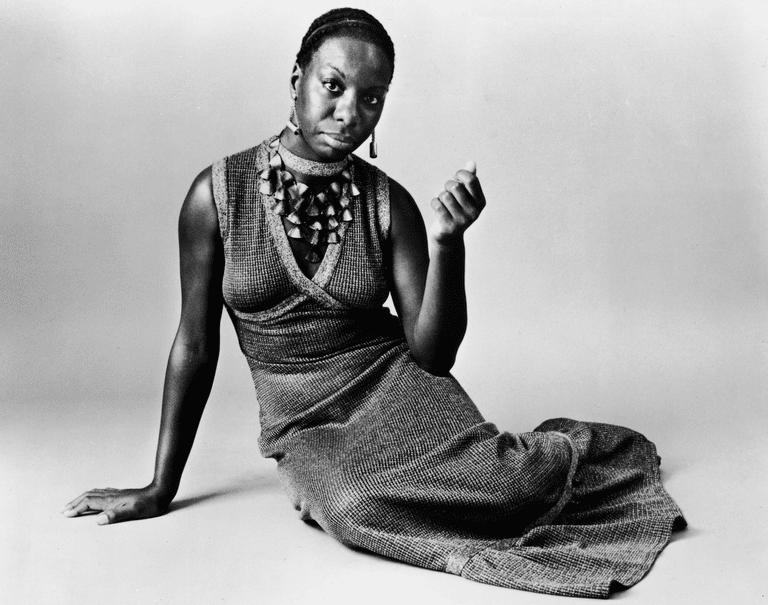 In 1993, Don Shewey wrote of Nina Simone in the Village Voice, "She's not a pop singer, she's a diva, a hopeless eccentric ... who has so thoroughly co-mingled her odd talent and brooding temperament that she has turned herself into a force of nature, an exotic creature spied so infrequently that every appearance is legendary." Nina Simone was born as Eunice Kathleen Waymon in 1933(*) in Tryon, North Carolina, daughter of John D. Waylon and Mary Kate Waymon, an ordained Methodist minister. The house was filled with music, Nina Simone later recalled, and she learned to play piano early, playing at church when she was only six. Her mother discouraged her from playing music that wasn't religious. When her mother took a job as a maid for extra money, the woman she worked for saw that young Eunice had special musical talent and sponsored a year of classical piano lessons for her. She studied with a Mrs. Miller and then with Muriel Mazzanovitch. Mazzanovich helped raise money for more lessons. After graduating from the Allen High School for Girls in Asheville, North Carolina, in 1950 (she was valedictorian), Nina Simone attended Juilliard School of Music, as part of her plan to prepare to attend the Curtis Institute of Music. She took the entrance exam for the Curtis Institute's classical piano program, but was not accepted. Nina Simone believed that she was good enough for the program, but that she was rejected because she was black. She studied privately with Vladimir Sokoloff, an instructor at the Curtis Institute. Her family by that time had moved to Philadelphia, and she began to give piano lessons. When she discovered that one of her students was playing in a bar in Atlantic City—and being paid more than she was from her piano teaching—she decided to try this route herself. Armed with music from many genres —classical, jazz, popular—she began playing piano in 1954 at the Midtown Bar and Grill in Atlantic City. She adopted the name of Nina Simone to avoid her mother's religious disapproval of playing in a bar. The bar owner demanded that she add vocals to her piano playing, and Nina Simone began to draw large audiences of younger people who were fascinated by her eclectic musical repertoire and style. Soon she was playing in better nightclubs, and moved into the Greenwich Village scene. By 1957, Nina Simone had found an agent, and the next year issued her first album, "Little Girl Blue." Her first single, "I Loves You Porgy," was a George Gershwin song from Porgy and Bess that had been a popular number for Billie Holiday. It sold well, and her recording career was launched. Unfortunately, the contract she signed gave away her rights, a mistake she came to bitterly regret. For her next album she signed with Colpix and released "The Amazing Nina Simone." With this album came more critical interest. Nina Simone briefly married Don Ross in 1958, and divorced him the next year. She married Andy Stroud in 1960 —a former police detective who became her recording agent—and they had a daughter, Lisa Celeste, in 1961. This daughter, separated from her mother for long periods in her childhood, eventually launched her own career with the stage name of, simply, Simone. Nina Simone and Andy Stroud drifted apart with her career and political interests, and their marriage ended in divorce in 1970. In the 1960s, Nina Simone was part of the civil rights movement and later the black power movement. Her songs are considered by some as anthems of those movements, and their evolution shows the growing hopelessness that American racial problems would be solved. Nina Simone wrote "Mississippi Goddam" after the bombing of a Baptist church in Alabama killed four children and after Medgar Evers was assassinated in Mississipppi. This song, often sung in civil rights contexts, was not often played on radio. She introduced this song in performances as a show tune for a show that hadn't yet been written. Other Nina Simone songs adopted by the civil rights movement as anthems included "Backlash Blues," "Old Jim Crow," "Four Women" and "To Be Young, Gifted and Black." The latter was composed in honor of her friend Lorraine Hansberry, godmother to Nina's daughter, and became an anthem for the growing black power movement with its line, "Say it clear, say it loud, I am black and I am proud!" With the growing women's movement, "Four Women" and her cover of Sinatra's "My Way" became feminist anthems as well. But just a few years later, Nina Simone's friends Lorraine Hansberry and Langston Hughes were dead. Black heroes Martin Luther King, jr., and Malcolm X, were assassinated. In the late 1970s, a dispute with the Internal Revenue Service found Nina Simone accused of tax evasion; she lost her home to the IRS. Nina Simone's growing bitterness over America's racism, her disputes with the record companies she called "pirates," her troubles with the IRS all led to her decision to leave the United States. She first moved to Barbados, and then, with the encouragement of Miriam Makeba and others, moved to Liberia. A later move to Switzerland for the sake of her daughter's education was followed by a comeback attempt in London which failed when she put her faith in a sponsor who turned out to be a con man who robbed and beat her and abandoned her. She tried to commit suicide, but when that failed, found her faith in the future renewed. She built her career slowly, moving to Paris in 1978, having small successes. In 1985, Nina Simone returned to the United States to record and perform, choosing to pursue fame in her native land. She focused on what would be popular, de-emphasizing her political views, and won growing acclaim. Her career soared when a British commercial for Chanel used her 1958 recording of "My Baby Just Cares for Me," which then became a hit in Europe. Nina Simone moved back to Europe—first to the Netherlands then to the South of France in 1991. She published her biography, I Put a Spell on You, and continued to record and perform. There were several run-ins with the law in the 90s in France, as Nina Simone shot a rifle at rowdy neighbors and left the scene of an accident in which two motorcyclists were injured. She paid fines and was put on probation, and was required to seek psychological counseling. In 1995, she won ownership of 52 of her master recordings in a San Francisco court, and in 94-95 she had what she described as "a very intense love affair"—"it was like a volcano." In her last years, Nina Simone was sometimes seen in a wheelchair between performances. She died April 21, 2003, in her adopted homeland, France. There's no other purpose, so far as I'm concerned, for us except to reflect the times, the situations around us and the things we're able to say through our art, the things that millions of people can't say. I think that's the function of an artist and, of course, those of us who are lucky leave a legacy so that when we're dead, we also live on. That's people like Billie Holiday and I hope that I will be that lucky, but meanwhile, the function, so far as I'm concerned, is to reflect the times, whatever that might be. To most white people, jazz means black and jazz means dirt and that's not what I play. I play black classical music. That's why I don't like the term "jazz," and Duke Ellington didn't like it either—it's a term that's simply used to identify black people." Jazz is not just music, it's a way of life, it's a way of being, a way of thinking. I tell you what freedom is to me: no fear. What kept me sane was knowing that things would change, and it was a question of keeping myself together until they did. Talent is a burden not a joy. I am not of this planet. I do not come from you. I am not like you. Music is an art and art has its own rules. And one of them is that you must pay more attention to it than anything else in the world, if you are going to be true to yourself. And if you don't do it—and you are an artist—it punishes you. Nina Simone with Stephen Cleary. I Put a Spell on You. Richard Williams. Don't Let Me Be Misunderstood.